The RAZR Hawk is designed for golfers who want a cannon in their hands. The 460cc head is more than 6 yards farther then Callaway's FT 9. It has all the pop and forgiveness that modern technology can provide. Although the driver is a little more subtle then the flashy 460cc Diablo Octane. Both drivers are made with materials developed with the help of Lamborghini. Yes, I'm talking about the race car. (Wait, does that mean that the drivers at Wal-Mart are made out of old Volkswagens?) This material is a forged composite that is lighter than air. (Not really -- but it is really light.) Whereas just the Diablo's crown is made of the carbon fiber, the entire body and crown of the RAZR Hawk is made of Lamborghini. Enough with the materials. Does it go far? The answer is an unequivocal yes. 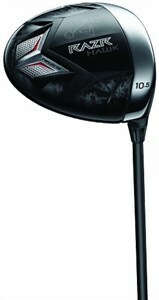 The driver is light and fast, and the sweet spot is huge. Toe and heel hits feel like center hits. This driver has all the bang of the Diablo, but you have more control for moving the ball either direction. On the down side, I'm not a big fan of the look of the crown. I don't like the silver curved seam with the two-tone. (Of course you don't see any of this at address.) And the only other flaw I can find is: Although the club is workable, it doesn't have a lot of feel. Mis-hits feel the same as regular hits.